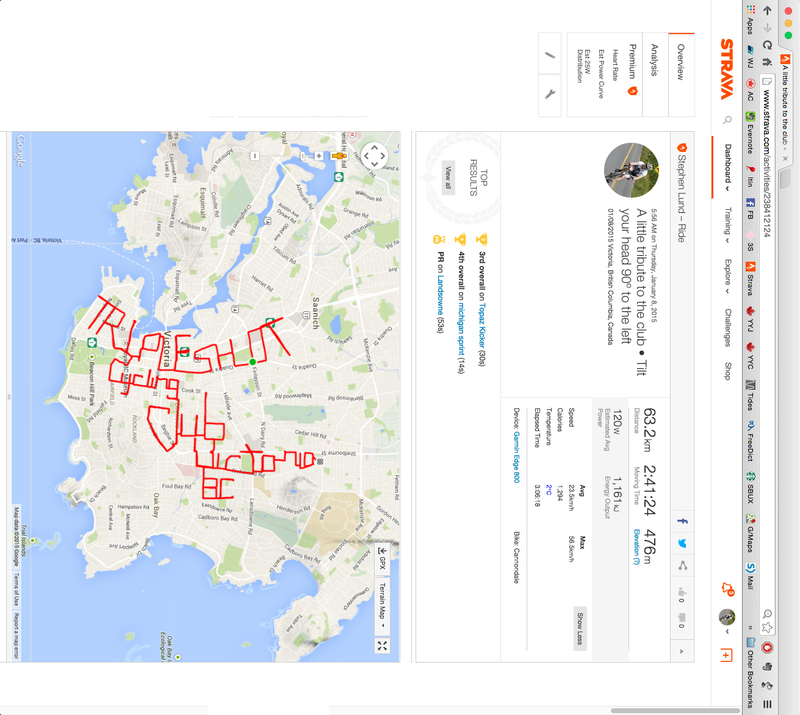 ← Is “Strava art” a misnomer? Shortly after scrawling my Happy 2015 message and muddling through my big Strava selfie, I set about planning my third Strava art and bike-writing project: a shout-out to the club I ride with in Victoria, BC. With upwards of 200 members, Tripleshot is Victoria’s biggest cycling club, well known for camaraderie, inclusiveness and an enthusiastic spirit of fun. I hooked up with Tripleshot right after I moved to Victoria three and a half years ago. After hundreds of rides with the Tripleshot gang, I can say unequivocally that the “Club of the Year” honours are well-deserved indeed. But oh, to be in Phoenix or Baltimore or San Fran – anywhere where the grid of roads offers a vast canvas of “Strava art pixels”! There’s no such thing as “writing on ruled paper” here in Victoria. This entry was posted in bike-writing, gps art and tagged bicycle, bicycling, bike-writing, creativity, cycling, Cycling Club, cyclist, garmin, gps, gps art, strava, strava art, Tripleshot, victoria bc. Bookmark the permalink.